To the tune of "I Left My Heart In San Francisco"...get it? Get it? The Bigso Box of Sweden comes from Swedish company Bigso AB, and I am in love with their boxes. 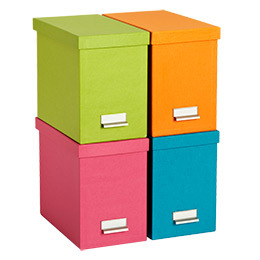 I first encountered one in Goodwill - gorgeous and sturdy paper laminate file boxes that were in the surprising hue of lime green. I scooped them up, came home, and gave the banker's boxes they would replace the evil eye. We are a household with a lot of paper. This is not going to change. We own a scanner, own a shredder, we're reasonably organized in that bills are never paid late and we can easily locate our children, but we have enough paper for three families. First, I am a paper snob - so there is my stationary collection to contend with (along with a tic that makes it hard for me to send the same person a note on the same stationary twice in a row). Second, I like to keep stationary and cards that are sent to me. And third, a category of items that outnumber the first two combined, is my husband's habit of keeping every piece of paper that has crossed his path for a minimum of six million years. You made it possible to store my husband's undergraduate thesis (he is forty-four) in a container that didn't remind me of moving boxes. You've made it possible for me to store blank reams of paper without having the room resemble an aisle in Office Depot. You've made me actually invent reasons to need one of your boxes. First image from Modern Eco Homes, middle from Lincoln Stationers, and the photo of this perfect, understated gray paper chest is from Crate and Barrel, but I'm not sure if they still offer Bigso. I find mine on Amazon.